By Jeff Robbins, CEO and Founder, LiveData, Inc. The use of Systems of Record, such as EHRs, has been a key strategy for achieving the Institute for Healthcare Improvement Triple Aim: improved patient outcomes and increased patient satisfaction, with reduced costs. With this in mind, the Health Information Technology for Economic and Clinical Health (HITECH) Act included requirements for meaningful use of EHRs, with significant compliance subsidies. Thanks to the HITECH Act, 83 percent of hospitals had some form of EHR by 2016. However, the promised benefits — no lost data, increased efficiency, and better patient experiences — have not always materialized. Some physicians and patients think healthcare is more inefficient than ever. To combat this, Systems of Engagement are being deployed to augment EHRs, simplify data collection, and share data in easy-to-consume visualizations, getting information to the right clinician at the right time to improve patient care. Every patient encounter must be recorded in a way that is effective, efficient, and accurate, and captures the audit trail for the clinician doing the data entry. The Health Insurance Portability and Accountability Act of 1996 (HIPAA) strictly governs data security, entry, storage, and privacy. Archiving data must ensure safety, redundancy, and retrieval for long periods of time. Meeting these requirements demands significant investment in time and resources. The need for comprehensive, accurate patient data increases data entry time, while the sheer amount of data to store and retrieve requires a large outlay in server space, and more IT help to manage. HIPAA requirements also affect IT resource requirements and significantly complicate the kind of system interoperability that has produced efficiency improvements in other industries. These issues are reflected in clinical attitudes toward EHRs. Many clinicians feel that EHRs slow down care delivery. This feeling is reinforced when organizations report declines in efficiency and financial losses. Wake Forest Baptist went from a $38.9 million operating gain to a $62.9 million operating loss in the year they implemented their EHR. Only $22 million of the swing was attributable to implementation costs. EHRs do have a measurable positive effect on patient safety. In a 2012 survey, 88 percent of providers who had attested to Meaningful Use reported that their EHR produces clinical benefits for the practice and 75 percent reported that their EHR helps them deliver better patient care. A 2016 survey showed a 30 percent lower rate of adverse events for surgical patients at facilities using an EHR versus facilities without an HER. So how can healthcare organizations resolve legitimate issues that providers have with their Systems of Record, while maintaining and improving on the patient safety gains that EHR use has delivered? That is where Systems of Engagement come in. Systems of Engagement overlay and complement Systems of Record, allowing users to share and collaborate on mission critical information, in real time or over days and weeks. The term describes everything from email to instant messenger and social media to enterprise platforms for data integration, collaboration, and comprehensive analytics. For healthcare, Systems of Engagement can mitigate the regulatory and safety burdens on Systems of Record, allowing for more rapid testing and targeted performance improvement initiatives. Healthcare Systems of Engagement have been slow to reach the market and to be adopted. Wariness among hospitals about further investment in software solutions is understandable, given the massive outlays involved in implementing EHRs and the lack of hard data for assessing the impact of new Systems of Engagement. To address this, software companies are partnering with analytics companies or incorporating analytics into their own tools. Analytics can give hospitals insight into the return on investment for Systems of Engagement, in dollars saved and quality improvements. 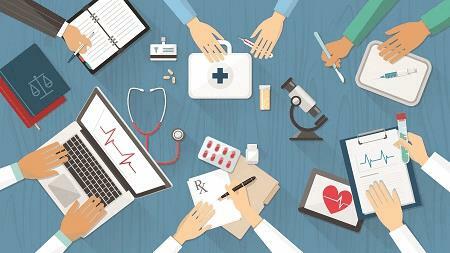 The recent focus on EHR implementation has also slowed software adoption. The HITECH Act mandated three separate states of attestation for Meaningful Use of EHRs, each more complex than the previous. Given the financial incentives and penalties associated with the Act, hospital IT departments have taken an “all hands on deck” approach to each Stage’s requirements. As Stage 3 requirements were only released in October 2015, many hospitals only now have the resources to consider software approaches to quality and utilization improvements. Lastly, hospitals as institutions tend to be risk averse, while the apprentice-based system of medical, especially surgical, education favors tradition and preservation of the status quo. In this environment, already reeling from the upheaval of the EHR, an additional layer of software can be a tough sell, but will be needed to meet the challenges of modern healthcare. In an industry where many still pine for the days of paper records and whiteboards, forward-thinking healthcare organizations will need to show the benefits that data-driven approaches can bring. Investing in Systems of Engagement that have a track record of success is the next step in securing comprehensive institutional buy-in to create a more efficient and effective healthcare world for patients and providers. Jeff Robbins is the visionary founder of LiveData. Under Jeff’s leadership, LiveData has become a cutting-edge software provider, winning US Army SBIR awards, providing data integration for the MGH OR of the Future, and developing LiveData PeriOp Manager, a unique real-time System of Engagement for surgical utilization management. For more information about LiveData, click here.